JP ONE, aka Jackpot Tha Chosen One is a Hip-Hop Artist and the CEO of Gifted & Talented, LLC. In Detroit, JP ONE has the privilege of being one of the elite lyricists, which doesn't equate to being one of the biggest artists in Detroit. In just less than four years. JP ONE has released six Albums. This year, July 27th he dropped his seventh LP "Fire & Brimstone II". And, he is currently working on "Fire & Brimstone III", which will be released in December, 2015. 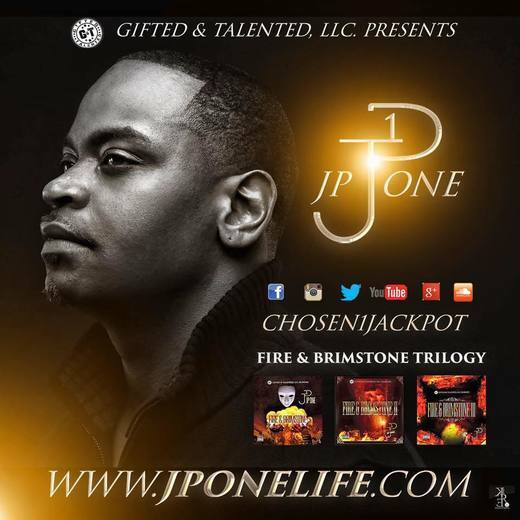 Summer 2015, Gifted & Talented, LLC presented JP ONE's "Fire & Brimstone Tour", which also featured artists Nep Jennings, Pierre Anthony, Jovie, and Gain Green. On this tour, artists performed at the hottest venues in New York, Illinois, Indiana, and Ohio. October 3rd, 2015 JP ONE will be opening up for National Hip-Hop Artists Lil' Boosie, Plies, and Twista for the End of Summer Slam Concert, taking place at Chene Park in Detroit, MI.